When is the best time to plant bare root fruit trees? 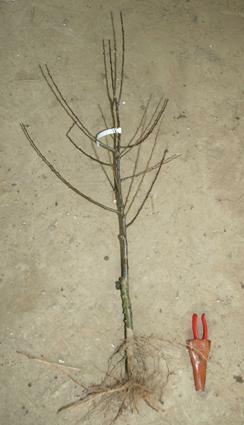 Recent Entries to this Blog When is the best time to plant bare root fruit trees? Grow your own in a small plot, or pot for that matter. One of the questions we are asked most often is "When is the best time to plant bare root fruit trees and soft fruit plants?" There is no single month that is the best, but for most things, the ideal time is in the autumn or early winter months before Christmas. 1. In general you can only plant bare-root fruit trees and soft fruit plants when they are dormant and this means October - April, depending on the season. 2. The soil is warmer as it hasn't cooled down through the coldest part of the year. This means that you are more likely the get some new root growth before the plants get to the dead of winter. 4. You may be able to water less. There is some anecdotal evidence that the plants need less water in their first spring as they will have already put out the first of their new roots and are able to make the best use of the available ground water. 5. Everyone plants in the spring! This is not a major problem, but you tend to find nursery men and women are a bit frazzled by the time you get to May! Also we are tending to get milder autumns and a cold snap around the start of February. This means that you can't plant at all until it thaws and the ground is moist again. If at all possible you should try and plant before Christmas to get the best out your plants. If you can't, don't worry. Most nurseries actually plant in the spring because they are busy lifting all their plants for sale, for gardeners to plant in the autumn. There are some exceptions to this rule: most notably Strawberry plants. If they have been cold stored they can be planted up until July. Just don't expect to get strawberries and cream in time for Wimbledon! This is useful information for this time of year. Thanks GFY!